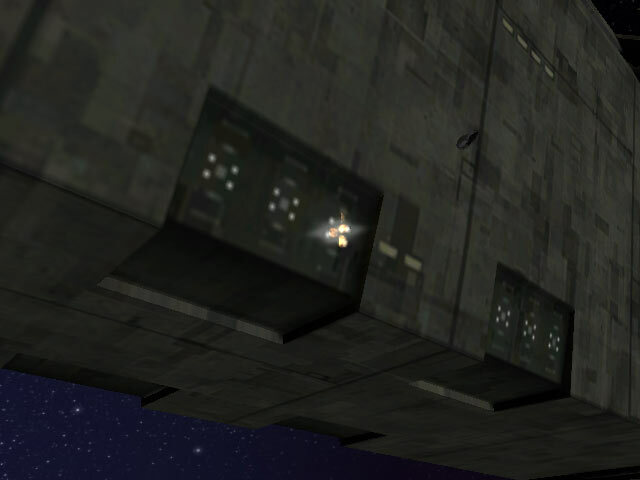 When it comes to determining size, there are very few objects in Halo: Combat Evolved more debated about than the Pillar of Autumn. There's evidence for two major viewpoints, although this discussion will show how one of those viewpoints can not be correct. First off, a little background on why a conundrum even exists regarding the Pillar of Autumn. Only Bungie really knows the intricacies involved in Halo's development, but we do know that the Pillar of Autumn's interior rooms were produced well before the exterior had been decided upon and finalized. The two main issues I wish to bring attention to in this article are: 1) What is the actual size of the Pillar of Autumn? and 2) Where does everything fit? Both questions are actually related. If it weren't for the fact that the interior doesn't, by any stretch, fit the exterior, the size problem wouldn't be an issue at all. How big is the Autumn? 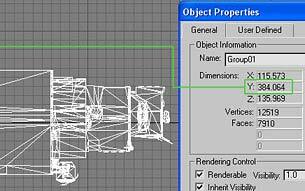 In a previous article I wrote, Determining the Real Sizes of Objects in Halo, I showed how nearly every object in the Halo game was constructed to a consistent scale, and that by being given a known value, a determination of a Halo object's 'real size' is possible. 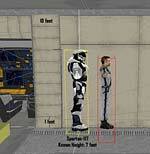 The example used was the known height of the Master Chief: about seven feet tall. Since everything but the very largest structures in Halo (the Halo ringworld, planet Threshold, etc.) are all at a consistent scale, we can begin to use the Master Chief as a measuring device. The rendering below is a shot of the side of the Autumn's bridge's port wall. The characters (Spartan-117 and Crewman) are appropriately scaled to one another and to the bridge. I placed both characters partway into the wall so a definite measure against the bulkhead was possible (ignoring the numbers that indicate the mesh sizes for the objects involved.) 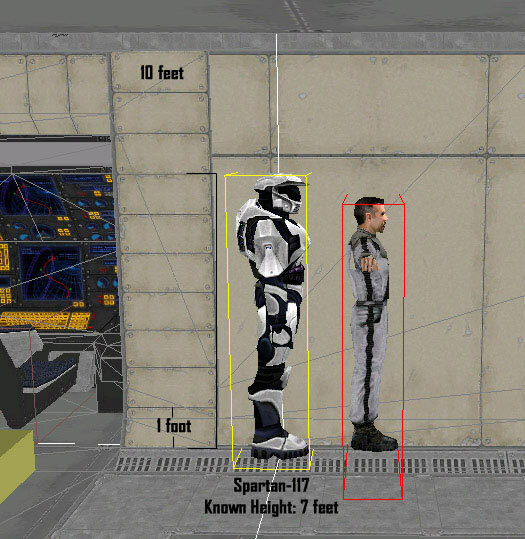 There are exactly seven panels behind Spartan-117 that are consistent with his height, so each panel can be considered one foot tall. This puts an estimate of the bridge height at a little more than ten feet. Where, in the orientation above, X=Width, Y=Length, and Z=Height. These numbers are based upon a seven-foot tall Master Chief and an approximately ten-foot tall bridge. Here's where one of the conundrums comes into play: when playing the level "The Maw", where you drive a Warthog along the ship's spine through a service corridor, a Nav Marker is displayed at two intervals. By adding the line-of-sight measures given by Cortana, one would think the Pillar of Autumn should be on the order of three or more kilometers in length. That measurement is indeed accurate to the length of the service corridor. The problem lies in the fact that, at an identical scale, the service corridor mesh is nearly three times the Autumn's entire length! The most reasonable explanation for this is that the interior and exterior for the Autumn were completed before it was decided that the end of the game would involve a lengthy drive for the Chief's escape. Only Bungie can clarify this. This is not the only issue with trying to reconcile the exterior of the Autumn to its interior. Where is everything in the Autumn? The other major problem with the Pillar of Autumn is that many of the rooms and corridor maps played in the game don't actually fit within the exterior confines of ship. There are several external cues to the location of certain areas such as the bridge and the Lifepod locations. The bridge is the only consistent location on both the outside and inside of the Autumn. 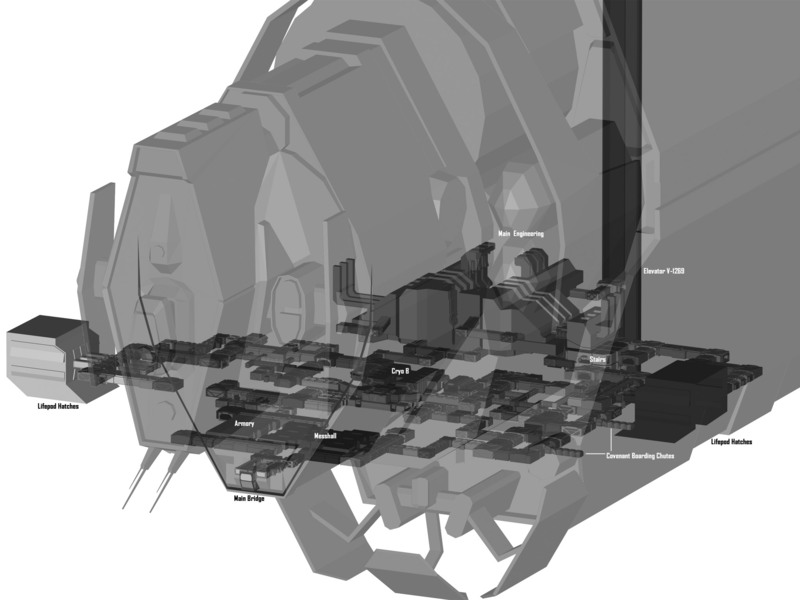 The following shaded render is a complete top-view and side-view of both the external Pillar of Autumn ship, and the interior rooms and corridors from both the beginning and end of the game, all put into a single graphic. This graphic is rendered at a consistent scale. 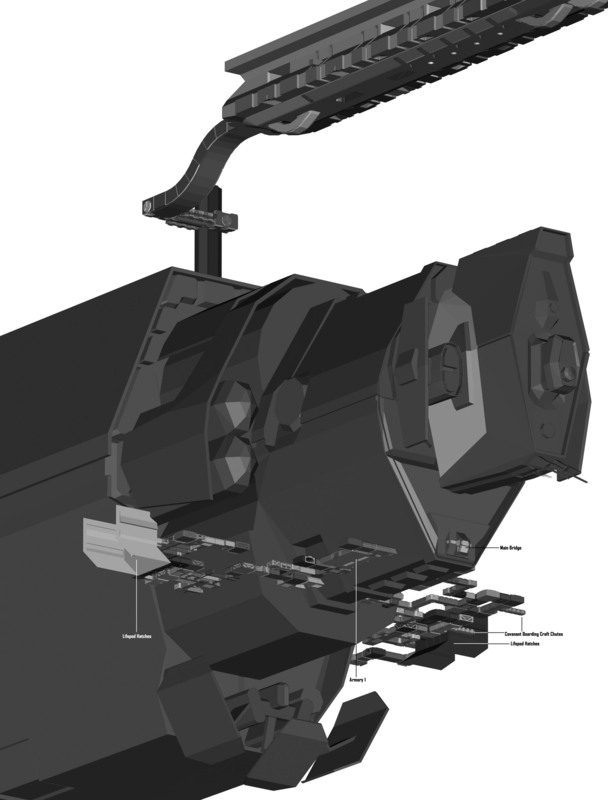 The first major item to note is that the Warthog 'Maw' drive at the game's end is fully three times the Autumn's entire length, yet it was supposedly a drive through the ship. This is where many people's discrepancy lies in measuring the Autumn's length; they're trying to not only measure the obvious part of the ship's exterior, but also the not-so-obvious part of it that just doesn't fit. I'm thinking the end of the game was a short notice bit of adrenaline rush they concocted towards as the Halo deadline neared, otherwise the interior might have been made to fit. 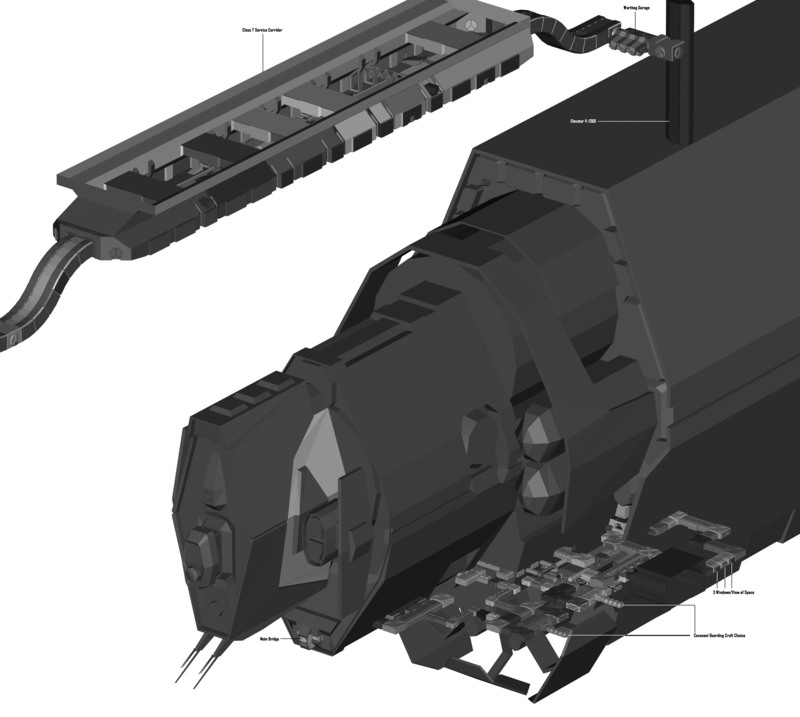 This next segment will show how the interior rooms and corridors of the Autumn are consistently scaled with the exterior of the ship, compared to game objects like characters and vehicles. In the next picture, I have placed a Lifepod in the airlock and in a nearby window, I have placed a Marine. The mesh of the Autumn used in this example is the mesh of the interior rooms, during the part of the game where you see the Covenant are shooting the emerging Lifepods. This is the map with the corridors in it, not the full exterior Autumn. . If the window were transparent in this render, you'd see the hallway beyond. Notice the size of the Marine compared to the window frame; he is approximately 3/4 of the height of the window. You can still see that Keyes is about 3/4 the height of the window! The graphic is somewhat blurry as it was necessary to get very close to the graphic so you could see Captain Keyes. Keyes was moved from the bridge section (which is still a part of the external Autumn mesh) and is still scaled as a part of that environment. 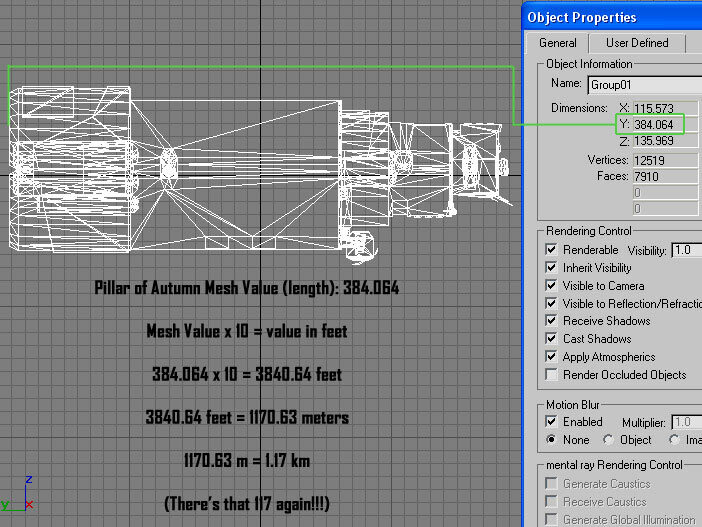 Due to the fact that the characters' and objects' sizes remain consistent with both the external meshes and internal game maps, it is clear that Bungie was consistent in the size of the map elements, and the Pillar of Autumn's size must be around the 1.17km long mark.